As a parent, you probably know that kids develop food likes and dislikes at an early age. That’s why educating young kids on nutrition is so important. When children understand the difference between healthy foods and unhealthy foods, better nutrition can be the result. Children are more likely to eat healthy foods like vegetables when part of a fun nutrition game they can enjoy. The best nutrition games will model good eating habits for kids and make nutrition enjoyable. Obesity in children between 2 and 5 years of age has risen dramatically worldwide in recent years. Poor eating habits must be corrected while kids are young, lest they become ingrained by the time they reach adolescence. Overweight children and adolescents are at greater risk of serious health problems, including high cholesterol, high blood pressure and type 2 diabetes. Unfortunately, the statistics show that overweight children and adolescents are more prone to becoming obese adults, making early intervention vital. There are a variety of fun nutrition activities designed to educate children about healthy eating habits. These activities help illustrate to kids the way vitamins and minerals support the body’s bone and muscle growth. Nutrition games such as the “Classroom Cafe” are interactive learning environments where the entire classroom becomes a restaurant. Children start by clipping pictures from food magazines and then sorting them into food groups like meats, vegetables, grains, dairy and fruit. After the kids have made their food choices, a “chef” will recommend healthy foods that he will then prepare and serve to each customer. This nutrition game teaches children that nutritious food can also taste good. Another fun nutrition game is the grocery store activity, which asks kids to brainstorm about nutritious foods that they should purchase in a grocery store or supermarket. After creating a grocery list, the teacher asks the kids if any of the foods should be considered junk foods. If so, then that food is removed from the list, leaving behind more healthy alternatives. 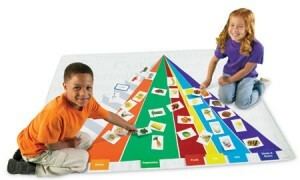 Yet another activity that teaches kids about better nutrition is the mystery food game. This games requires a brown paper bag which is then filled with different food items like a hard-boiled egg, a banana, an apple, a pretzel, and so on. Each student will then be given a chance to feel the food items inside the bag. The child will then describe the size, shape and texture of each item. Correctly-guessed items should be displayed for all the students to see. There are many other enjoyable and educational nutrition activities children can play, such as a pizza party, guessing games, nutrition field trips and online nutrition games for kids. At home, you might try creating your own television cooking show for kids or watching child nutrition videos together. Enjoyable and healthy nutrition games can go a long way toward instilling proper eating habits in your kids from a young age. Making nutrition fun for kids helps them to better understand how good nutrition affects the body’s development in a positive way. There are a wide variety of educational games to help children learn about the five food groups. These food group games have easy-to-remember basic nutrition facts based on USDA guidelines and help promote the importance of all five food groups. Learning games like these promote healthy messages about eating balanced meals consisting of of foods from all five food groups. One fun nutrition game involves teaching children that the best way to ensure a nutritious meal is to color their plate with all the colors from the rainbow. The foods with the most colors are fruits and vegetables. The winner of the game has the most colors, and the learning message is clear: the more color on the plate, the more nutritious the meal. Fruits are also a colorful and fun way for children to learn about proper nutrition. Fruit nutrition games provide children help kids to learn about how fruits contain important vitamins and minerals that fight disease and help their bodies grow strong. Proper serving sizes and healthy portions are fundamental to healthy eating. Portion size games help kids learn what is a healthy serving and how to estimate healthy portions. Nutrition games that introduce children to the fun of gardening and fresh food can help instill good habits for the long-term. When kids learn about gardening and planting, they are more likely to make the connection between food and a healthy body. Cooking games are another great way to introduce healthy foods to children. Activities that are designed to help kids learn about healthy foods that can be substituted into recipes will lead them to create healthier meals. Diet and exercise pledge sheets can help children take concrete steps toward living a more healthy lifestyle. Kids learn how to set goals for eating healthy foods as well as exercising daily. 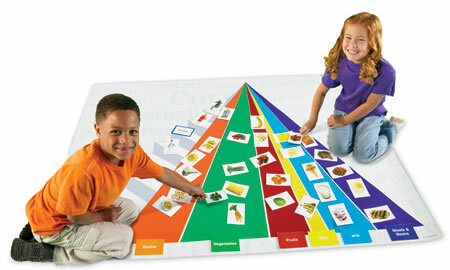 Fun and educational nutrition games help children learn about the five basic food groups. These kinds of activities help promote healthy messages about eating balanced meals based on the MyPlate guidelines.